Lame Horse - How To Deal With Equine Lameness? You can usually tell if your horse is suffering from lameness just by watching her movements. When she is trotting, you may notice unevenness in her gait. Depending on the severity of the condition, this may not be very noticeable. In some cases, the horse may also throw her head as she walks. This movement is frequently done by horses when they are uncomfortable. A lame horse can be the result of many different factors but most are connected to the joints, bones, and muscles. Arthritis can sometimes be a culprit or even fractures of the bones. 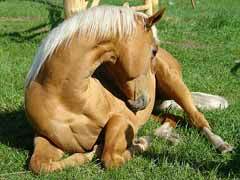 If the horse has strained her tendons or has muscle soreness, she may also have difficulty moving normally. Injuries, such as cuts, can also cause the problem. Another cause can be horse hoof problems, including foot abscesses or foot inflammation. White line disease can also be a reason. This condition occurs when the wall of the hoof begins pulling away from the inside part of the hoof. Research suggests a fungus may be responsible for this condition. Whatever the reason, the condition can lead to a lame horse. If you are concerned that your horse may be experiencing this problem, someone skilled in equine veterinary should give him a through physical examination. They can begin with the feet and start the search for a cause. In some cases, the culprit is easy to recognize without further tests. When that doesn’t happen, X-rays and nerve blockers can be used to pinpoint the problem so it can be properly treated. If more detailed imaging is needed, MRIs or CT scans can be used but they are expensive and do require your horse be anesthetized. In some cases, problems with a lame horse may be prevented through the use of horse joint supplements that can help ward off inflammation.